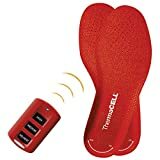 Before I bought my first pair of insoles I must have read 30 Thermacell Heated Insoles Reviews before I made my decision. That’s just the way I am when I buy stuff online. I want to make sure I get exactly what I want because I absolutely hate having to send stuff back and then wait for the arrival of the correct item. Upon arrival I immediately plugged them in so that I could get a full charge and start using them as soon as possible. The first day I used them it was 14 degrees Fahrenheit and I was set to help my nephew shovel driveways to raise money for his basketball team so I thought it would be a perfect test. When I first put my boots on with the heated insoles in them it felt a bit tight, like my boots were almost too small. So then I pulled out the original insoles from my boots and put the Thermacell insoles back in. Then they felt great. The best part about these is that there are no wires. They come with a wireless remote so that you can set the temperature easily. The actual battery is built right into the insole which allows them to be wireless. I read a lot about a few other pairs that had a separate battery pack that you had to tuck into your sock and that is the biggest reason why I went with the Thermacell insoles. They have 3 settings…….Standby, Medium and High. Medium gets up to 100 degrees Fahrenheit and high gets up to 111. I did read quite a few online reviews saying that these insoles didn’t get very warm but I didn’t have that problem at all. I started out with them on high and I had to turn it down to medium because high was just overkill. Since then I’ve used them in a wide range of temperatures getting as cold as -13 Fahrenheit. When it gets to that extreme cold the heat certainly doesn’t feel like overkill anymore but I could still notice a nice warmth that made a huge difference to my comfort level. So the people complaining about them not getting warm enough must have had a defective pair because I can’t imagine anyone saying that there is not enough heat. There is plenty. They come equipped with two lithium-ion polymer batteries built right into the insoles. When I first charged mine I left them plugged in for about 3 hours because I noticed that they already had a bit of a charge when I took them out of the box. Ever since that first time I’ve noticed that they take about 3.5 hours to fully charge when they are completely dead. I usually use them with a combination of the medium and high setting so I’ve been getting varried results in terms of how long they last. I was happy with the amount of time the held a charge for the most part. I’ve tested a lot of heated gloves and it’s very rare that any of them last longer than 5 hours. They come with a wall charger but you can also get a car charger for $7.61. I’ve now used mine for an entire winter which probably amounts to about 35 uses and charges. So far the charge holds just as well as it did when I first got them. According to Thermacell they are good for 500 charges which seems like a really long time. I really doubt I will ever use mine that many times before I throw them out due to my stinky feet. They seem to be well built because mine are certainly holding up nicely. I’ve never owned any other Thermacell products so I can’t speak to their quality too much but I know they have a good reputation and they are also easy to deal with for exchanges or refunds especially if you buy them on Amazon. After my experience with these insoles I would most deffinitely recommend them. You can research these all day long if you want because there really are an endless amount of reviews on them especially on Amazon. If you see a lot of negative reviews on Amazon you have to remember that a lot of people only write product reviews when something goes wrong and they want to vent because they’re upset. Just the shear amount of thermacell heated insoles reviews you can find online tells you how popular these are. The reason they’re popular is because they are a great product and they work, simple as that. If you have any questions or want any more info on these insoles just leave me a message using the box below. I’m always quick to respond.